Cats and toys go together like burgers and fries, like ham and cheese, like Brussels sprouts and bacon (…Brussels sprouts?). Well, anyway, cats love to play with toys. They do so for good reason: they are practicing for the hunt. Even if they’re strictly indoor cats, it’s still important for them to embrace their wild heritage. It’s part of their instincts, and play brings out those instincts in constructive ways. So, which toys are the best? 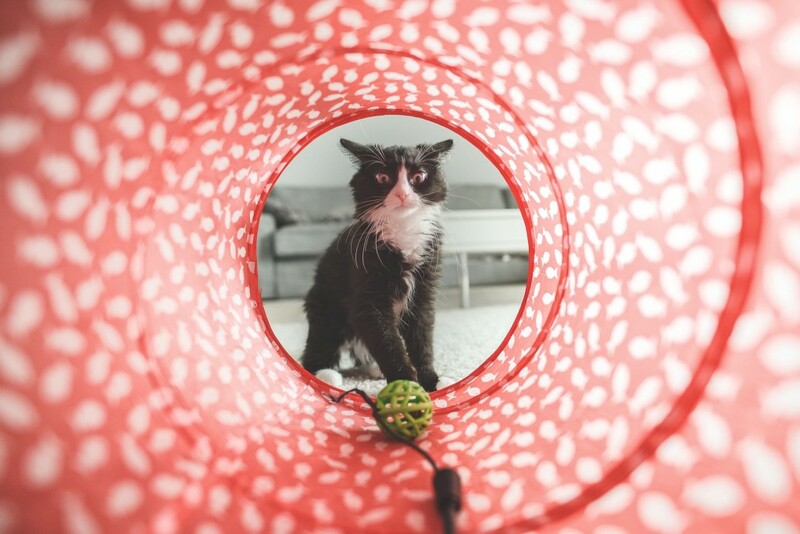 Well, rather than recommending specific toys and brands, let’s take a look at what types of toys your cat will enjoy the most. When we think of cat toys, the quintessential image is that of a mouse-like object on a string. Cats love to chase things. It’s part of their instincts as hunters. We should encourage that because chasing objects provides the best kind of cardio exercise for cats. It’s also what they want to do, and it’s never a bad thing to encourage cats to explore what comes naturally to them. It satisfies their need to hunt and capture, and that in turn could dissuade them from “attacking” and punching holes into your socks and other clothing. Your cat gets to flex their instincts, you get to keep your belongings intact, everyone’s happy. Most cats love their own space, their own little hideaway. Cat condos provide just that. They’re a bit like miniature treehouses, and they can offer a wonderful adventure and seclusion. Cat condos also provide ample opportunities for climbing and rest. These are attributes that can come in handy for cats in the wild. Cats need sanctuary from predators, as well as a place to sleep and hide. They can be solitary creatures and having their own hiding place can give them a private space to relax and a feeling of safety. Cat condos can provide that space, and thus encourage their natural instincts while still being indoors. The best of both worlds. 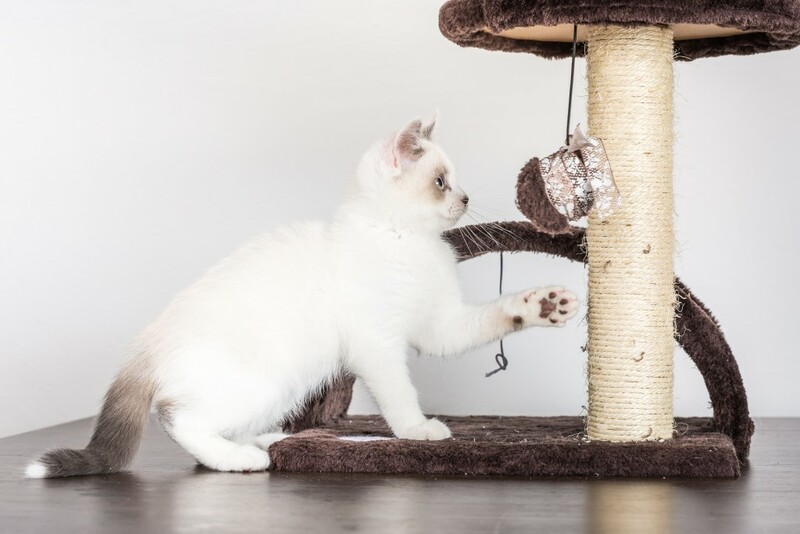 Puzzles toys, also known as interactive toys, stimulate your cat’s natural curiosity and engage them in playful activities that keep their interest and attention. 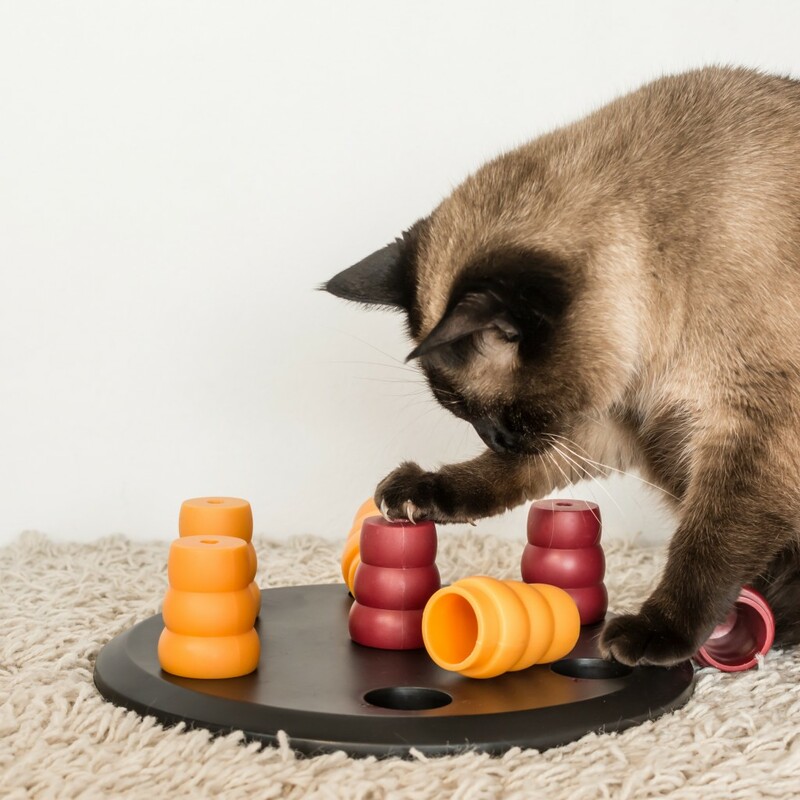 Puzzles engage your cat’s brain and keep it stimulated. This can relieve boredom, which can lower the chance of destructive behavior. Cats can spend a majority of their day alone and asleep. So whenever you have the chance, stimulating their minds will help them stay alert and fully present. Not everything is about encouraging the hunting instincts or stimulating the mind. Sometimes it’s about proper grooming and the health benefits that come from it. 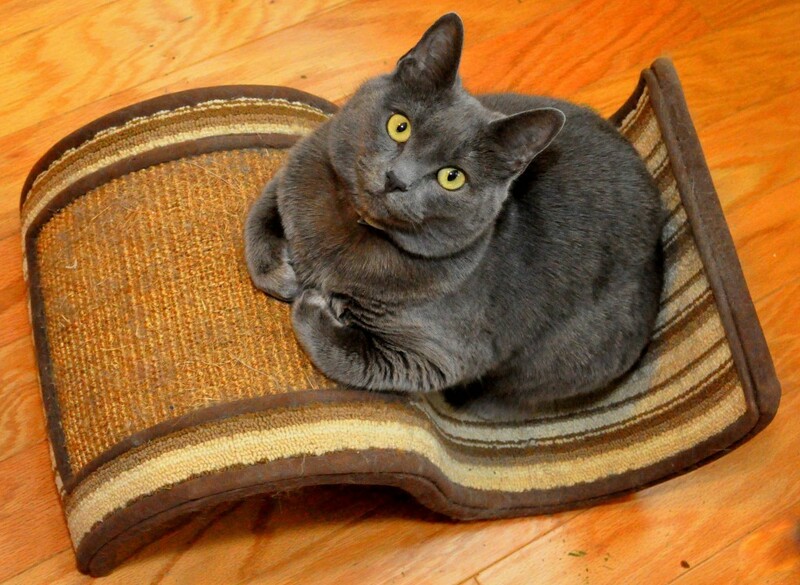 Scratching posts and boards allow cats to maintain their claws and keep them trimmed. The alternative could be that cats will scratch anything and everything. Scratching toys can help with that. They also come in all shapes and sizes to keep your cats feeling occupied and content. Cats love to be entertained just like the rest of us. Their idea of entertainment might be different than ours, but it satisfies an important part of their psyche. Play is vital to their development as cats. Even though they might not live in the wild, they need to express who they are. Without proper channels of this expression, they could demonstrate it in ways you might not particularly like. However, if done right, you can help your cats reach their potential. You might just keep your furniture and wardrobe intact at the same time.